In my view, fresh, ripe tomatoes are meant to be enjoyed in their natural state, and nothing beats the taste of a tomato straight off the vine. When I start gathering the tomatoes from my garden, I’ll often stand near the plants and just enjoy inhaling the wonderful smell. I follow my family’s tradition and eat lightly salted slices or I just bite into one and add a pinch of salt with each bite. Little grape or sungold tomatoes adorn our salads and the boys eat them by the handful. 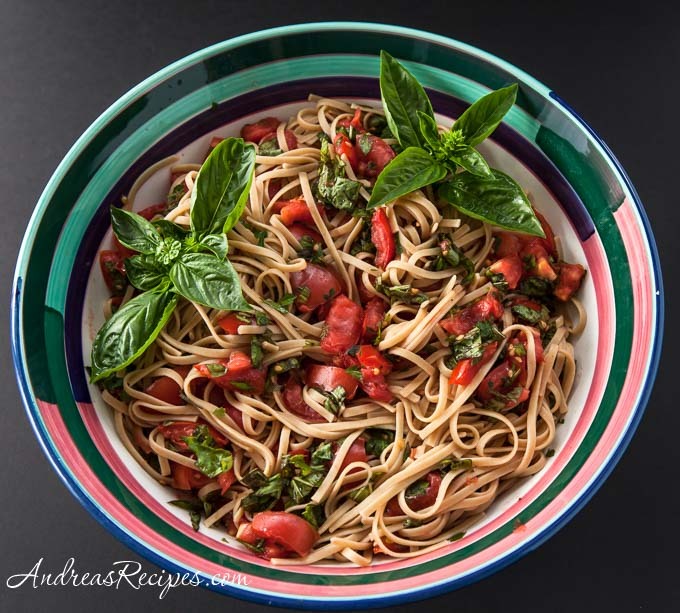 This summer we are growing San Marzano tomatoes, the classic Roma tomato for Italian cuisine, and I couldn’t resist making a no-cook sauce using these terrific tomatoes and some fresh basil and thyme from the garden. The kitchen was awash with the heady aromas of basil, garlic, and thyme, which also seemed to cling to my hands for a few hours after making the sauce, but I didn’t mind a bit. We thought the flavor was very good, and it was a no-brainer, easy dish to fix. You just mix together all the sauce ingredients in a bowl and let them sit at room temperature for up to three hours, then toss it with cooked pasta. You can make this a quick weeknight meal if you shorten the sitting time for the sauce. Michael and I agreed that there isn’t enough sauce for a pound of pasta, so we would double the sauce next time. Stir together the tomatoes, olive oil, basil, thyme, garlic, black pepper, and pepper flakes in the large bowl. Set aside at room temperature for at least 30 minutes or up to 3 hours. Toss the sauce together with cooked linguine or other pasta and serve immediately. If you like lots of sauce, then I suggest doubling the ingredients. Hey, we are channeling each other. I also saw this recipe in Fine Cooking and am planning to try it. Andrea, yum yum! I wish I were there to taste this delicious dish. This looks like the perfect sauce for fresh from the garden tomatoes! aah..a woman after my own heart. my daughter would love this dish. Do you ever stop and think how lucky we are that we can indeed grow our own? Hi there! Gosh this is without doubt one of my favorite ways to have pasta! It’s even better with the zest of a lemon on it as well. It tastes like the epitome of spring/summer to me! Fresh! Kalyn, I think you and I like a lot of the same things! Anh, I would be glad to share some. Amy, it really did work nicely with our San Marzano tomatoes, and the fresh aroma was wondeful. Inge, I’m really looking forward to our bigger garden next summer after we put in the raised beds. Zebra, the lemon sounds like a nice addition. Fresh, fresh, this looks so good. I like the lemon idea also! Awesome, easy and delicious! Your china is so beautiful. And you added your picture on your profile!!! Neat! Tanna & Cris, thanks! The lemon does sound good. And Cris, that pottery is from Medellin, Colombia. I got a set while I was there because I thought it was so pretty! Oh, that looks AMAZING! I will have to try it. Tomatoes in summer!!! I love them. I live in Alabama and the tomatoes are unbelievable. I really like the look of this recipe and I’m always looking for new ways to use the heirlooms. Try adding a dash of balsamic vinegar.